Watch the 2017 MR OLYMPIA FINALS & PRE-JUDGING Streaming Video Online for FREE @ amazon.com! Once again, Joe Weider brings us his annual weekend of sports and fitness in Las Vegas Nevada! The Mr. Olympia competition will be celebrating its 53nd anniversary this year where yet another Mr. Olympia, new or current will be crowned victorious! Hosted at the New Orleans Arena along with one of the worlds largest expos hosted once again at the Las Vegas Convention Center. Scheduled for the weekend of September 14th to the 17th, the events actually get started on Thursday the 14th with the Olympia Press Conferences and Meet the Mister Olympians events. Excitement is a tame word for the biggest weekend in the sport of Bodybuilding when it comes up on the city of light, Las Vegas once again on 2017! Watch the Events LIVE online! 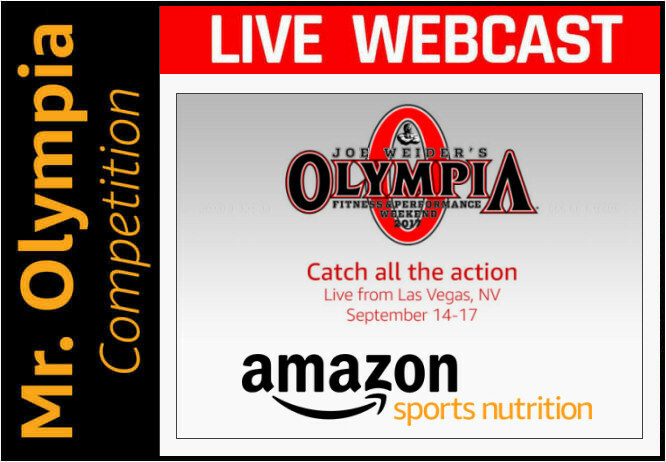 Thanks to the tremendous effort over at amazon.com for providing this FREE webcast of the Mister Olympia events for those of you who cannot make it out to Las Vegas in person. High quality video from the comfort of your home! This year you can enjoy all of the streaming action not just on your computer or laptop but also on your smart phones and media tablets.. now that is technology that is taking our sport to the next level! With this kind of access, it's pretty much impossible to miss the action!